Madonie Mountains - See Palermo and Western Sicily. Driving northward in Winter along the A-19 Palermo-Catania highway (autostrada) in the stretch near Polizzi Generosa and Caltavuturo, you pass a series of high rocky peaks usually covered with snow from late December until mid-March. It's the highest part of the Madonie range, and it's a majestic sight. The Madonie boast Pizzo Carbonara (Carbonara Peak, formerly Pizzo della Principessa), at 1979 meters (about 6000 feet) the highest point in Sicily after Mount Etna. Eagles and hawks soar overhead. The Madonie are an extension of the Nebrodi and Peloritan mountains to the east, and with them are part of a rugged chain extending through Italy across Calabria and Sicily and then into Tunisia. 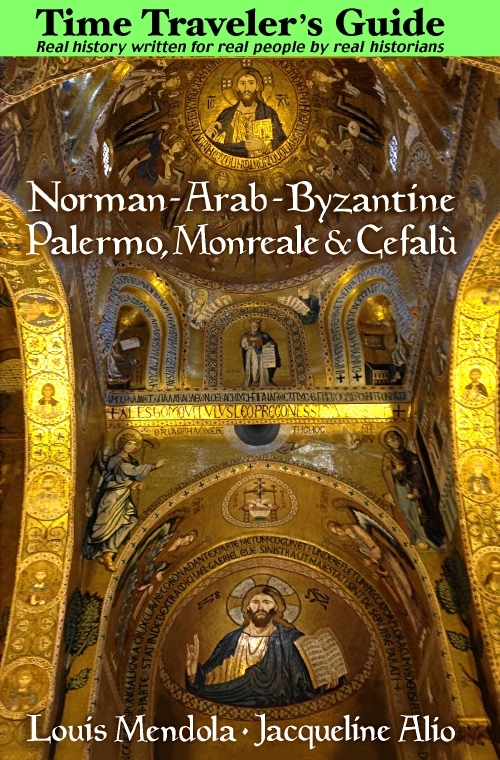 Many of the towns nestled into the Madonie are of Saracen Arab foundation, dating from around the ninth century, and were subsequently developed further into larger villages under the conquering Normans. Several are ancient, built upon the remains of Sicanian, Greek and Roman settlements. The Madonie region extends, between the towns of Scillato and Castelbuono, from the Pollina to the Imera rivers, reaching down to the foothills visible from coastal Cefalù. The land itself is often wooded, and while few wild cats and no native deer remain, it is a beautiful area, especially in Winter. There are porcupines, foxes, hares, numerous birds of prey and some re-introduced deer. Among the native flora are the giant holly (some over three hundred years old), wild olives (oleasters), and the rare local variety of Madonian Spruce or "Sicilian Fir" (Abies Nebrodensis), as well as the flowering Manna Ash (Fraxinus Ornus). Like many "micro-regions," the Madonie has its own cuisine, and a typically rural lifestyle. In recent decades, emigration has depleted the population of many of the hill towns, but these scenic mountains remain popular with residents of Palermo seeking to escape from the city for a few days. It's a favorite area for hiking. At the Piano Battaglia resort, there's skiing for a few weeks in January and February. Indeed, these mountains are the only area in western Sicily where snow typically lasts for more than a few days. 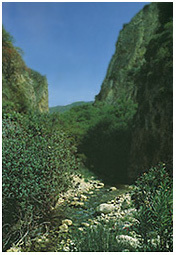 The Tiberio Gorge, formed from limestone erosion, on the Pollina River near San Mauro Castelverde, is one of the area's many attractions. The "Madonie Park" is a protected reserve encompassing several townships, including Cefalù, Pollina, Castelbuono, Geraci Siculo, Petralia Soprana, Petralia Sottana, Polizzi Generosa, Sclafani Bagni, Caltavuturo and Collesano, as well as the villages of Gratteri, Isnello, San Mauro Castelverde, Scillato and Lascari. When the Normans fought several minor battles here in 1062-1063, the largest Saracen (Arab) Muslim towns were Kalat-Abi-Thur (Caltavuturo) and Petralia. The towns in the Nebrodi Mountains to the east were predominantly "Byzantine" settlements peopled by Greek Orthodox Christians before the arrival of the Arabs.